There are so many fitness classes out there these days that it can be hard to determine just what it is you need in a class. We’re going to let you in on a little secret: as long as these four aspects are involved, you’ll be in pretty good shape. Fit Central in Columbia offers fitness classes that you’ll love when you join our gym because all of them meet these requirements. Whether you’re taking a Les Mills Bodypump class, a yoga class, a HIIT class, or another class entirely, having a good fitness instructor or trainer is key. A good instructor can motivate you, correct you or offer modifications so you don’t injure yourself, and help your group fitness class or fitness bootcamp be full of energy and fun. It’s often a good idea to try out a new gym before committing and see how you like the classes’ instructors. Get to know all of Fit Central’s experienced fitness class instructors and visit one of their classes before making a decision. Let’s be real — if your fitness center isn’t close to your home or your work, then you may find it more difficult to attend the gym regularly. No matter how motivating the fitness class you signed up for may be, not too many people want to drive far distances early in the morning or late at night. Unless you’re a highly motivated person who adores working out, try finding fitness classes offered at a local gym that isn’t so far away that it will discourage you from attending often. This aspect is in the same vein as choosing a good location. If you sign up for a membership at a fitness center but none of the group exercises work with your schedule, then how often will you actually attend and reach your fitness goals? Instead, look at the class schedule before you sign up. If there’s a yoga class offered right before or right after work, you’re in luck! If that Zumba class is offered when you’re stuck in traffic on your way home from work, then keep looking. Fit Central offers group fitness classes at many different times of day to try to accommodate your needs. You’re handing over your hard-earned money to a gym near you each month, why shouldn’t you get some perks at the same time? Free Childcare. It can be difficult to reach your fitness goals when you have your young kids for the day. Instead, try to find a fitness center that allows you to bring your kids! Many gyms these days will provide free childcare while you work out so that you can get busy burning calories and not worry about your children. Kitchen Area. Many gyms now have restaurants, smoothie bars, coffee corners, and more for their members to enjoy. At Fit Central, we’re pleased to offer you a coffee spot with complimentary coffee or tea that you can enjoy before or after your workout. This is a great place to chat with friends, and we even have a toaster oven and microwave so you can stay fueled with hot foods after your workout. Free Wi-Fi. Is there anything worse than listening to your Spotify playlist or streaming your favorite TV show and then losing service? Or what about when you arrive at the fitness center early and could get some work done if only there were Wi-Fi? At Fit Central, we’ve planned for this. We want you to be able to easily browse the internet while you wait for your group exercise class to begin. Opportunities To Socialize. One of the biggest motivators in attending the gym is having friends who are at the fitness center with you. When gyms offer clubs or social events for you to meet other fitness gurus, you’ll enjoy increased companionship. Our fitness center is pleased to involve members, staff, and guests in Encore once a month. During this time we visit, support, and inspire each other. There is also a club dedicated to running that meets often to run together outside. When you look for these four aspects in a fitness class, you’re sure to enjoy your time and be motivated enough to continue attending. 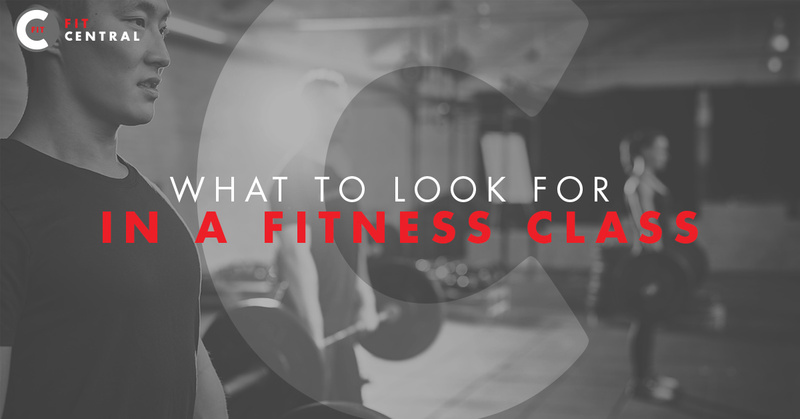 We’d love to have you at Fit Central in Columbia, so sign up today — your first class is free!